Unlike traditional reservoirs that have hard to see graduations molded directly into the plastic, INTEGRA reagent reservoirs are made of crystal clear polystyrene and fit into a reusable base with bold, clearly visible graduation markings. 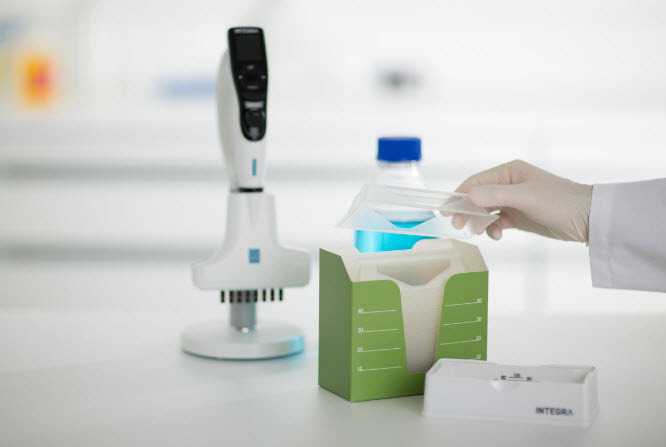 The patented design of INTEGRA reagent reservoirs refract light so graduations below fluid become clearly visible, making it easier to identify the exact desired volume line. This unique design feature leads to more accurate reagent measurements, no over pouring, and less reagent waste.